It's very early days but I have so far been very impressed by AmazonDrive. So much so that it has made me want to write a few comments. Firstly I need to be clear about my usage, as that may determine if what I say is helpful to you or not applicable. I want a way to backup the contents of my Synology NAS to the cloud automatically. I do not want any process running on a PC to facilitate that. It must be a direct NAS to cloud file copy. The true backup providers, like HiDrive, that support NAS backups, are too expensive for the amount of data I want to store. I therefore have to use a consumer cloud storage synchronisation solution. There are several available, Microsoft OneDrive, Box, Dropbox, Google Drive and of course AmazonDrive that I have just started to use. There are others but I don't know enough about them to consider using them. The most important data that I want to protect are our irreplaceable photos. We have getting on for nearly 20 years of photos in digital form, taking up over 800GB at the moment and currently growing by over 200GB per year! I thought I had a solution in OneDrive because, a couple of years' ago, they offered unlimited cloud storage and I specifically took out OneDrive then, for this very purpose. I knew Microsoft had stopped that offer but I had stupidly assumed that Microsoft would honour their contract and retain unlimited space for those existing customers. I was wrong, Microsoft have now started to cull drives over 1TB. They claimed customers were abusing the available storage space but if you offer unlimited, people are going to take you at your word. Don't blame customers for selecting the best value product for their needs! I am just on the cusp of the terabyte that Microsoft have limited us to but in a month or two I would easily be over that storage limit! I can be as annoyed as I like with Microsoft but I can't see that getting me my storage back. I therefore have to find an alternative. Of the providers listed above, at this moment in time, only Amazon offers an unlimited or large capacity solution at a price I am prepared to pay and that I can use directly from my NAS box. I have signed up for the free trial of AmazonDrive that will continue on to the paid solution in three months' time. I am most interested in the NAS synchronisation and the web client. I specifically do not want a desktop client that synchronises to my hard drive. I have nearly a terabyte of data in the cloud and only a 256GB SSD on my laptop. Microsoft OneDrive is a pain, being automatically installed and linking to the cloud automatically. Even when I set the client to online files only, the local directory information for the thousands of files I have online, takes up a large chunk of the local hard drive! With AmazonDrive I can opt not to use the client at all. The web client supports drag and drop file, and more importantly for my initial setup, folder upload. It is a clean interface with just the options I need. 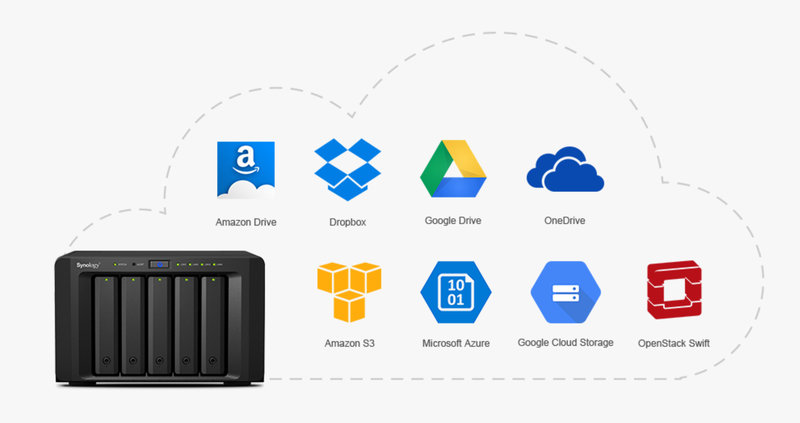 The Synology client for AmazonDrive is part of the same tool used for OneDrive and Google Drive etc.. So far AmazonDrive has worked well. It does not have all the sort and view options of some of the others and does not have any online editing, as far as I can tell but for pure storage and ease of use, it suits what I need it for. I used a cloud storage aggregator to help with the transfer of the data.